Capacity up to 680-3,000 lbs. 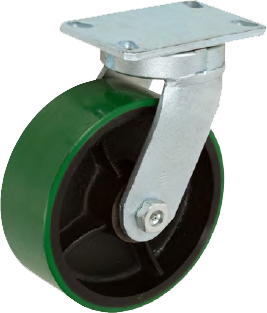 5 9/32" x 7 1/4" 3 3/8" x 5 1/4"
to 4 1/8" x 6 1/8" 3/8"
Series 93-94 casters are made from forged steel. Top plate and inner raceway are forged from one piece, providing a superior raceway construction for shock conditions. This forged design outperforms the standard steel plate welded to tubular steel inner races, especially in abusive and impact-loading conditions. Kingpinless caster design - no swivel kingpin to bend or break. Better than standard casters at withstanding shock and impact. Last longer, saves money. Based on original superior patented design. Drop forged upper and lower cup. Hardened swivel raceway. Corrosion-resistant zinc plated finish.